The traditions of Thanksgiving, as we know it, have us scrambling to the nearest grocer the week before the observance to pick up the implements we need to create a fabulous spread for our loved ones. However, have you considered what you have on-hand – as in growing in your own yard (or that of a neighbor) – that you can incorporate into your dishes to give them local and seasonal touches? Why Not Host Thanksgiving From the Yard? Taking a cue from the Native Americans and pilgrims responsible for the birth of Thanksgiving, why not forage for some ingredients this year? While it would be a huge endeavor to try to create an entire meal from foraged goods (you’d be our hero if you do, however), you can easily find local fruits, seeds, nuts, mushrooms, and herbs that would be a wonderful addition to your meal. Heck, you can even label the menu, “Thanksgiving From the Yard”. You should be prepared with a vessel of some sort – a plastic bag or basket works great – to bring your treasures home. Bring scissors or a knife along to cut stalky vegetation. Always ask permission to gain access to a neighbor’s yard before entering or picking fruit from their trees. Educate yourself on what is edible and what is not. No Into the Wild reenactments, please. In the Pacific Northwest, November is typically the tail-end of harvest season but there are still a few items worth keeping an eye out for to jazz up your holiday meal. Apples and pears. They make for great pies, of course. You can also make sauces, applesauce for example, or jelly, crumbles, or cider. Nuts and seeds are easy to find, though some nuts, such as walnuts, do require some drying time before they are edible. Local varieties to watch for include hazelnuts, walnuts, pine nuts from Gray Pine or Sugar Pine trees, and acorns. You might even be able to find sunflower seeds from the dried heads of the flowers. 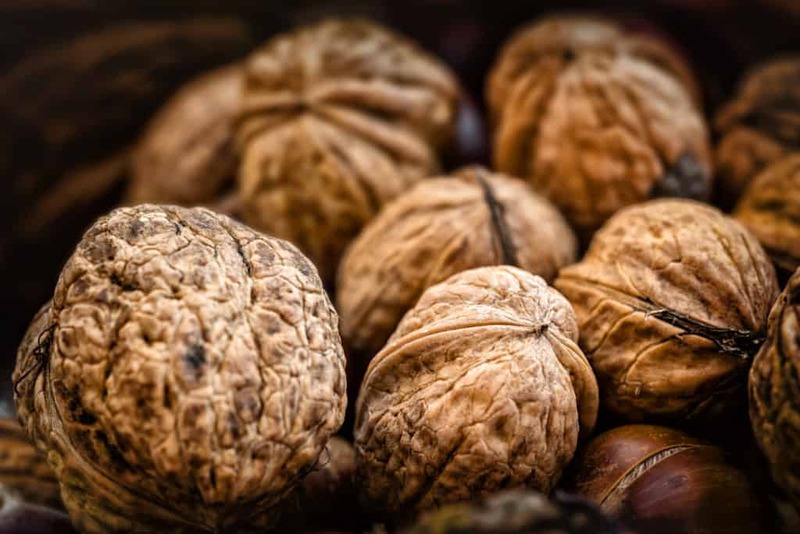 Nuts and seeds can be added to a number of dishes; chopped for salad, roasted atop casseroles, added to pies, or simply as a snack or addition to a selection of appetizers. Mushrooms flourish this time of year and can be harvested from forested lands. There are dozens of edible varieties that can be added to stuffing and casseroles, stuffed with other savory ingredients, and can even be added to gravy. If you are not experienced at foraging for mushrooms, we strongly recommend that you seek the guidance of someone who is. Wild and domestic herbs can be found just about everywhere! Rosemary is a favorite addition to dishes because of its aromatic and pungent evergreen scent. Dandelion greens can be sauteed or added to salads for a touch of bitter to balance other flavors. Bay leaf is great for adding flavor to soups and stocks. Foliage, while not necessarily edible, can also be gathered. Use it to make centerpieces and arrangements to bring a touch of the outdoors to your gathering. Pine cones, pine boughs, and other wild elements provide a rustic, homey touch to your holiday decor. Speaking of pine, serve up this festive pine needle cocktail (courtesy of Liquor.com) made from pine syrup, lemon juice, and cranberry that will be sure to wow your guests. Oh, and make sure to invite your dear friends from ArborPro! To make the cocktail, begin by preparing a simple syrup. Boil one cup of sugar in one cup of water until the sugar is dissolved. Add a handful of pine needles, stir, and remove from heat. Allow the mixture to steep for about two hours before straining the needles from the syrup. In a shaker, add a dash of bitters with one ounce of freshly squeezed lemon juice, 15 cranberries, and a half ounce of the pine simple syrup. Muddle everything together. Add an ounce of vodka or gin (optional) along with ice and shake until blended and chilled. Strain into a glass, over ice, and top with a half ounce of lemon-lime soda. Finally, garnish with a couple of cranberries and a small sprig of pine. Alternately, pine needle tea is a warming drink to help fight off bugs during cold and flu season. Thanksgiving from the yard – or that of your nice neighbor next door – is a great way to use local, seasonal elements to kick up your holiday feast. The team of tree care experts here at ArborPro wishes everyone a happy, healthy, and foraged food-filled Thanksgiving!